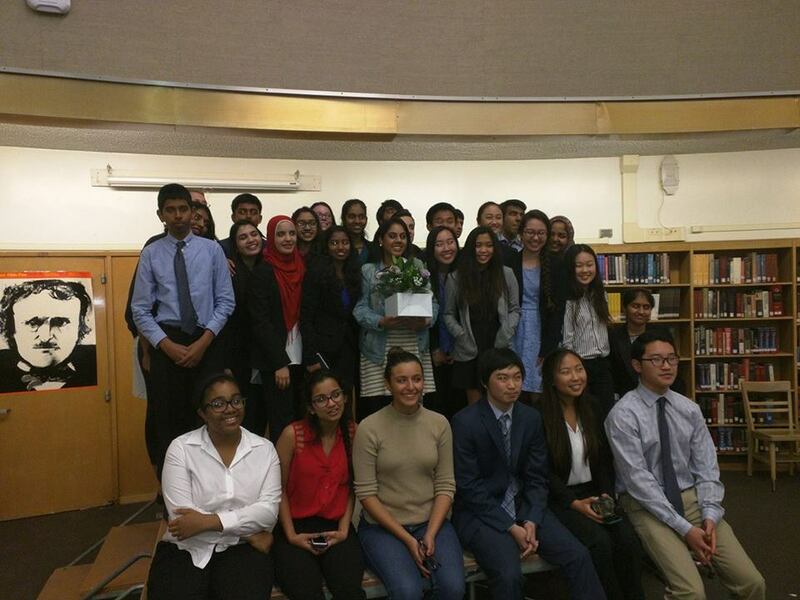 The 2015-2016 WHS Speech and Debate team with their coach, Ms. Kahlon. West High’s Speech and Debate team held its annual Speech and Debate Showcase in the library, with two shows at 3:30 and 6pm on March 11. The main objectives of the showcase were to interest prospective Speech and Debaters, as well as raise funds for future competition expenses, including those of the upcoming state-wide competition. Hosted by members senior Young Woo Cho and sophomore Layal Aryan, the showcase featured speakers from an assortment of events in addition to an abridged debate in the form of Spontaneous Argument (SPAR). Ideally, “aspiring members [would be able to] have the full spectrum of events,” explained Aryan. Junior Sowmya Pendem performed an Oratorical Interpretation, “The Price of Shame,” by Monica Lewinsky. Pendem channeled the passion of Lewinsky herself as she implored the audience to seriously consider the implications of public humiliation in the modern-day context of social media.. At the height of her speech, Pendem’s powerful voice reverberated along the bookshelves and second floor of the library. In a Dual Interpretation, junior Amanda Guan and senior Hana Schlosser performed “This is a Test,” by Stephen Gregg. Through their performance, they highlighted the competition and pressure of high school. Guan used Mandarin phrases throughout her role as the teacher of Schlosser’s character, Alice, as Alice struggles to do well on the exam and keep up in class after missing the single day in which Mandarin was taught. Before sophomore Jasmine Campos’ Dramatic Interpretation of “Bailey” by Ed Vela, Cho asked the audience to provide topics for senior Tiara Kaimal to do an Impromptu Speech on. After several suggestions, Kaimal decided on the topic of potatoes, suggested by Tanner Aryan, enthusiastic audience member and younger sibling of Speech and Debate team members Ghazi and Layal Aryan. Campos channeled her inner diva as she portrayed the different characters: the quarrelling, divorced parents, and Bailey, the child caught in the middle. With equal parts sass and sensitivity, Campos effectively portrayed tense familial relations between Bailey and her mother. Kaimal urged the audience to consider the potato’s role in everyday lives. She stated that they were versatile, durable, capable of being mass-grown, and most importantly, nutritious. “A world without potatoes is not a world at all,” she said. Needless to say, Aryan gave an enthusiastic standing ovation. In a skit during the intermission, junior Ghazi Aryan, Guan, and sophomore Alex Mills portrayed three hobos huddled around a bonfire, represented by a trashcan, commiserating in the cold as they spoke with awe-filled voices of a warm room filled with books. “If only we could get to a library…” said Mills, trailing off as he, Aryan, and Guan slowly turned to look at the audience, humorously breaking the fourth wall. Upon applause, the trio hopped off of the stage and walked around with the trash can for donations. Resuming the program was freshman Ashley Xia’s Humorous Interpretation, “Depressed White Girl,” by Brandon Daley. In a memorable valley-girl accent, Xia narrates a wild chain of events caused by Depressed White Girl’s licentious behavior, beginning with her breaking the news to her parents that she is pregnant, and ending with her discovering that she was in fact impregnated by aliens. In “The Long Road Home,” Original Prose written and performed by junior Grace Kim, the audience was transported to North Korea, then China, as they followed the story of a young woman’s struggle for freedom when she escapes from North Korea in hopes of starting a new life in China with her younger sister, only to sympathize with the anguish of the narrator upon her imprisonment by strangers. Kim’s performance, like all of the performances before hers, had captivated and immersed audiences without props. Solely through the use of expressive body language, hand gestures, facial expressions, and voices, speakers brought to life various characters and personas. The final event was a SPAR, “a battle of wit and logic,” Cho explained, in which participants must be able to think especially quickly on their feet to argue their position on a spontaneously given topic. Senior Nadir Akhtar and Noah Choi faced off against senior Lekha Adari and Michael Nishida to debate whether Shrek or Frozen was the superior of the two movies. Akhtar and Choi argued that Shrek told of an individual who helped others see the good within themselves, and that the following movies were indicative of its compelling message while Adari and Nishida argued that Frozen embodied the empowering feminist message that the princess was capable of saving herself. Little moments of hilarity that delighted the audience throughout the debate were the presidential-candidate-like demeanor of Adari as she advocated for Frozen (“A vote for Frozen is a vote for education”), puns (“Your argument just got frozen”, “They got shreked”) from Akhtar and Choi, and riveting Japanese rendition of “Let it Go” by Nishida, arguing Frozen transcended language. With substantial cases made from both sides and tied vote from the audience, Ms. Kahlon declared Akhtar and Choi the winners. Kahlon, who was appointed as the new Speech and Debate coach this year, said she was “so proud of all [the team’s] hard work and [their] dedication to [the] team.” She enjoyed her first season with the team, and hopes to keep the momentum going well into the next season.